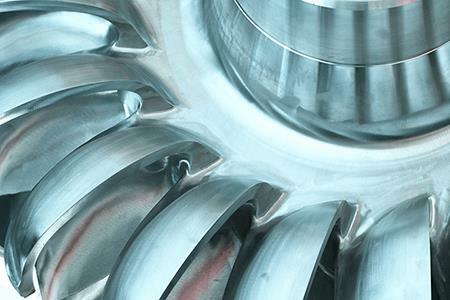 Halifax Water and the Water Research Foundation’s study finds that turbine generators can do more than just replace the work of pressure-reducing valves (PRVs). Water systems have an untapped potential to recover energy using in-line hydroelectric generation and to reduce net energy consumption, greenhouse gas emissions, and operating costs. The Water Research Foundation (WRF) co-funded a project with Halifax Water, Nova Scotia, Canada to investigate the installation of a hydrokinetic in-line energy recovery turbine generator within its water system to determine the system’s benefits and operational characteristics. The journey began in earnest in 2010, when Halifax Water began investigating the feasibility of energy recovery instead of traditional pressure reduction using pressure-reducing valves (PRVs) in its water distribution system. A driver was the launch of the new provincial renewable energy initiative called the community feed-in tariff (COMFIT) program, which offered preferential energy rates to renewable energy generation projects that led to the reduction of greenhouse gas emissions in Nova Scotia. The approved COMFIT rate of $0.14/kWh for run-of-river hydro allowed the Halifax Water project to proceed based on sound financial and performance estimates and a reasonable return on investment (ROI). Without this preferential energy rate, the project’s rate of ROI would not have been as attractive and may have prevented the project from moving forward. Halifax Water retained a consultant to conduct a preliminary study of the potential for energy recovery using an in-line turbine (ILT) from Halifax Water’s control chambers that used PRVs or flow control valves (FCVs) for downstream pressure and flow control. Several potentially viable sites were identified. The selected site, the Orchard Control Chamber, was thought to be the best initial site for research and development of a prototype system because of its relatively stable but significant diurnal flows and level of pressure reduction. 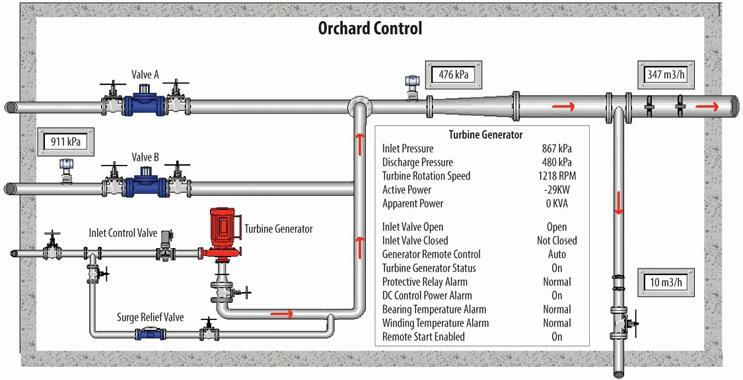 Furthermore, the Orchard Control Chamber supplies water to two large reservoirs that provide significant hydraulic cushion for pressure transients that could result from the operation of the ILT, thus presenting a low risk because the potential failure of any prototype turbine generators would have a minimal impact. The Orchard Control Chamber was also in close proximity to an easily accessible point of interconnection with the electrical grid. The turbine and generator were selected with a turbine size based on the average diurnal flows of 3.9 cubic feet per second and a head of 130 feet. From the project outset, the objective was to develop, install, and commission a small in-line recovery system that could be used in place of, or operated in parallel to, an existing PRV system, and operate effectively and within a pressure-controlled municipal water distribution system. A critical factor was the ability of any in-line energy recovery system to control upstream and downstream pressure transients in the water distribution system because of the lack of tolerance of some of the older sections of Halifax Water’s distribution system for significant pressure or flow transients. A portion of the Orchard research project was also to investigate how pressure transients could be controlled and/or eliminated. Data was collected to allow Halifax Water to identify both normal and upset operating conditions created by both the water supply system and the operation of the ILT and bypass PRV system. The data was collected to allow Halifax Water to correlate downstream effects (pressure/flow transients) with the operation of the ILT and the bypass PRV system and identify detrimental conditions. The project involved the development, design, installation, and commissioning of the Orchard Control Chamber ILT for energy recovery. It also looked at the operational characteristics and effects on water quality and the overall water distribution system. Every successful project requires an internal project champion or project manager who is committed to seeing the project through to successful completion. This includes keeping finances in check, keeping the project on track, and helping with system integration when the project becomes operational. Each site must be carefully evaluated for its energy recovery potential, taking into consideration the diurnal flows, pressure reduction, and longterm utilization of the site. The sites with the highest flows, pressure differentials, and longest operating hours are usually those to consider for technical and economic details. Any project must meet provincial, state, or federal regulations established for the design and operation of water treatment and distribution systems. For instance, for this project “NSF/ ANSI 61 — Drinking Water System Components — Health Effects” certification was required for the PAT. An accurate financial model must be developed, depicting realistic capital costs for the project, including accurate energy generation estimates. Utility staff that will be responsible for the ongoing maintenance and operation of the turbine generator should be consulted early in the process. Consider hiring a reputable contractor who can provide both mechanical and electrical installation services and has completed similar scale renewable energy projects in the past. Conduct post-installation testing and condition monitoring to understand how the energy recovery system operates and affects the water distribution system and to maintain acceptable levels of water quality and service. Monitor the turbine generator performance in terms of forecast versus actual energy revenues, operating costs, ROI, and payback to help evaluate the success of the project. Jeffrey Knapp, FEC, P.Eng., CEM, is manager of energy efficiency at the Halifax Regional Water Commission, Nova Scotia’s largest water, wastewater, and stormwater utility. Halifax Water provides water, wastewater, and stormwater services to over 80,000 customers in the Halifax Regional Municipality. Linda Reekie, WRF research manager, joined the Foundation staff in 1997. Prior to the Foundation, Linda worked at a county health department in Colorado for 10 years, coordinating the water quality program for five years. She also has five years of experience as an environmental planner for a county planning agency in Pennsylvania. She graduated from Pennsylvania State University with a B.S. in environmental resource management.